Today's Coupons - Expire in 15 hours. No matter how many times a bird dog pins a covey, or a big old rooster, or a wary grouse, there is always a monumental adrenaline rush in the hunter that comes with finding a bird dog on a hard, stylish point. There is nothing to compare to it in the world of upland gunning! A dog's pointing instinct can't be taught; it's genetic and inherited instinct that is a result of generations of selective breeding. But it can be refined, improved and perfected, and that is the subject of this hunting dog training video ...the "point" - the whole realm of the point - from evaluating a pup's potential, to putting the finishing touches on a dog that's steady to wing a shot and fall. Harold Adams and Dave Meisner are uniquely qualified to be featured in dog training videos. Adam has a degree in Education and has been training pointing dogs for over 35 years. Meisner has owned, trained, and trialed pointing dogs for over 25 years and was a pioneer in producing dog training publications and videos. 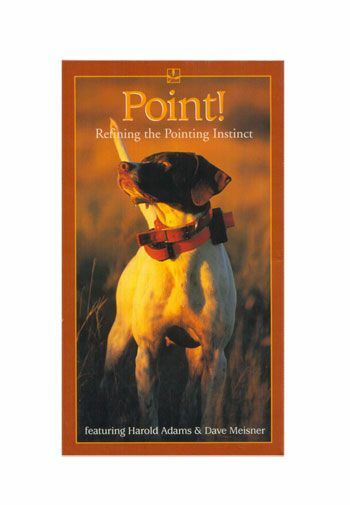 He is currently the publisher and editor-in-chief of The Pointing Dog Journal, the only full-color magazine devoted exclusively to pointing dogs.